I was a juggler on a tightrope balancing over a pool of crocodiles. I had way too many balls in the air–complex plot, historical references, multi-layered characters, puzzles, action scenes, spiritual themes, challenging settings, dynamic relationships. I was struggling to remember who had done what, who knew what, and did I change that yet in a previous chapter? The crocodiles were hungry to snap up anything that fell. I could struggle through with Word. I’d written my first novel in Word, using global finds to locate my last stopping point with “start here,” or “changes needed,” or highlighting my notes to myself in red. I had a separate Word doc with character profiles, and another with chapter summaries, among others. I knew there had to be an easier way. What I didn’t know is that writing software would change my entire approach to writing a novel. The non-colored column of boxes on the left are “parts” of my book. The columns of color-coded boxes are chapters within those parts. To use the story board format, I had to start thinking of my novel in a different way. Instead of one long manuscript, I had to separate it into major parts. This immediately helped me focus on the vital turning points in my story. 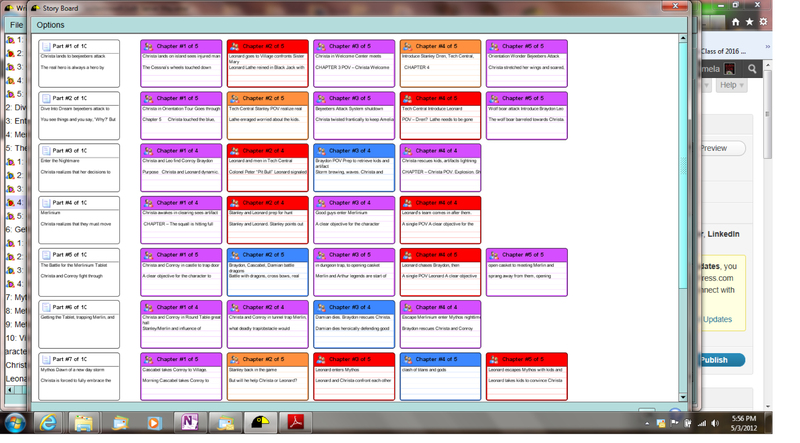 It also forced me to organize scenes into more manageable parts. I can rearrange scenes simply by dragging them into place. 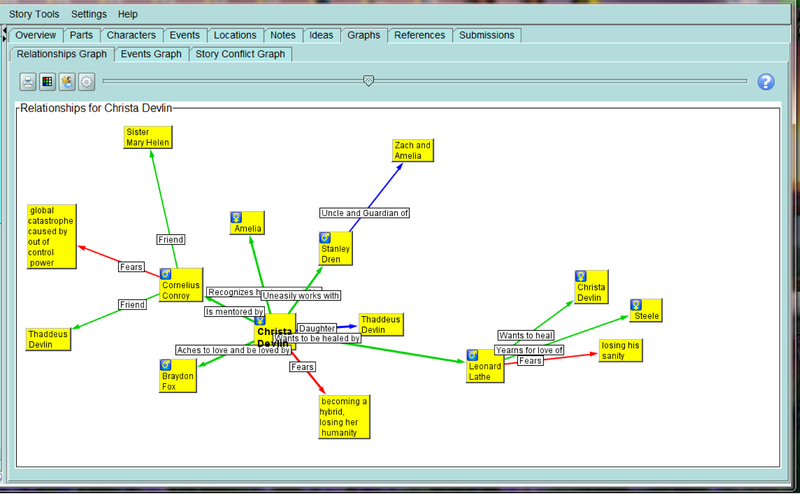 Any change I make on the story board is automatically transferred to the main writing/editing sections of the program. Pull down tabs also take you to whichever chapter you need to work on next. Write It Now 4 also has global find/replace, a thesaurus, a character name generator, writing prompts, a timeline feature, and tabbed sections for settings, ideas, and notes among its features. It’s not so much a program for writing, as a program for inspiring, organizing and expanding upon ideas. Writing programs like this won’t work nor appeal to every writer, but I do recommend it to thriller writers and others with way too many balls in the air (hmm, maybe that is every writer). And to those out there who use other writing software, like Scrivener, I’d love to hear from you and share your thoughts in the comments, below.